This dish was created as a way to enjoy a typical Maritime lobster dinner in a single bite or two. In Nova Scotia lobster is almost always boiled but steamed lobster is becoming more popular, personally I prefer it boiled in heavily salted water to give it that fresh from the water flavor. Once cooked the lobster is served chilled with hot butter, quite often, but not necessarily clarified. Typical accompaniments are potato salad, and homemade rolls. It may all sound a bit old fashioned but some things are not to be toyed with! This culinary delight if often served outside on a patio or picnic table because no self-respecting Maritimer serves their lobster pre-shucked, knowing how to get into a lobster is learned at a young age! The tools provide are a lobster cracker for breaking the claws and a lobster pick for getting the meat out of those hard to reach places. Traditionally, in Atlantic Canada, lobster is served cold, dipped in hot butter outside on a picnic table and the potato salad is one of the most popular accompaniment. This is the best of both worlds. In a large bowl toss all ingredients and let cool for about 1 hour. 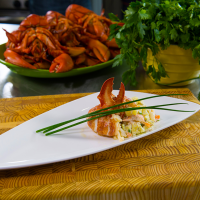 To assemble, place lobster potato salad on the base then finish with a piece of cold lobster dipped in hot butter, garnish with fresh chives.